Th-INK-ing of You: To a Special Little Princess! Hello friends! I hope you had a wonderful weekend! Our journey continues as we try to get my husband's Cumadin levels right. Today his bloodwork had him at 4.9, which is way too high, so the adjusting begins. LOL! I can see this will be a journey of adjustments until we get it figured out. Other than that, he is doing well, and thank you all for your continued prayers! Today I have a fun card to share with you that I made Sat. for the inspiration challenge on SCS. THIS was the inspiration piece I chose from a great store, Layla Grayce. I created this easel card using the new Special Girl Set from Our Daily Bread designs. I used Websters Pages ( In Love) papers on a Bazzill base. I used Spellbinders Ornate Artisan Tags & Accents, Ribbon Banners, and Marvelous Squares. Don't forget the CHA sale going on now! Shipping will be delayed until Jan 18th, but look at the savings!!! While ODBD is at CHA, you can save 20% on all Stamps Sets and Singles! *Please note that this sale does not include Stamp Bundles. This limited time sale starts today, January 10, 2013 and runs through Wednesday, January 16, 2013 Midnight EST. Click here to shop via the website and be sure to enter code CHA20 at checkout! Gorgeous card, Grace! I love the colors, papers and magical image! Wonderful coloring and design! Sure hope DH can get his levels under control soon. Hope you are feeling better, too! Sending big hugs and continued prayers for you both! Awww Grace this is perfect for your princess! Gorgeous. Love the colors, image and the dies you used. I pray your husband's levels get regulated quickly. such pretty, framing and coloring of the image, lovely touch with the flourishes and pearls, the inside is perfect too! grace, this is so cute and lovely! Such a gorgeous card, Grace. I love all the die cut flourishes and pearls, and the image is so cute. Thanks for sharing with us at Word Art Wednesday. Lifting prayers for your husband's health. Blessings! the card is very prettily finished with th ecarriage awaiting the pleasure of the Princess. OH Grace, this is just dazzling.. 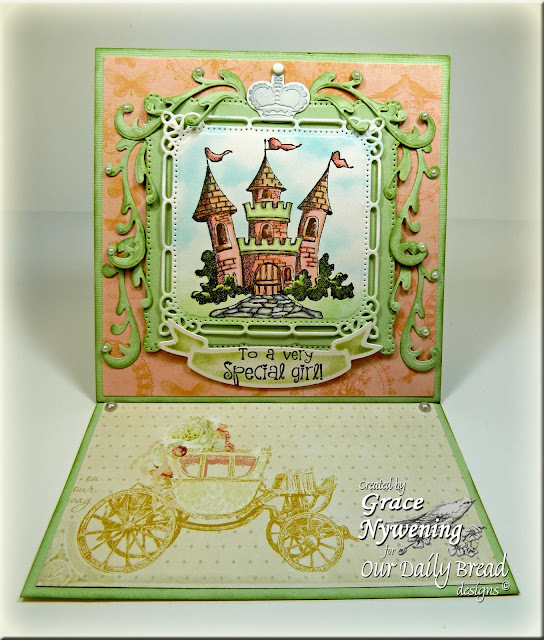 I love how you framed the castle, so creative and I just love the design paper with the carriage. Just a darling card. Colored so awesome. Thank so much for joining us at Color Me Creative challenge. We love seeing your creation. Good luck on the challenge. What an absolutely stunning card GRace!! I just love your coloring of the castle, your framing with the foliage and your choice of dp!! Gorgeous!! What beautiful coloring and I just love the way you framed the castle! !Thanks for joining us at CMC. What a Great Project! I just love it thanks so much for joining our Birthday Theme and for helping us celebrate our 3rd birthday! Wow! This is absolutely amazing! i am in awe! Thanks for joining us for our Birthday Blog Hop Challenge today! I hope you'll join in for the other daily challenges for more chances to win prizes! Grace, this is awesome! Such a great project! So glad you joined us in our Birthday celebration at Catch The Bug! We appreciate your participation! Good luck and we hope to see your wonderful work again! Beautiful! Thanks for joining us for our birthday celebration at Catch the Bug Challenge Blog.